Abstract submission for the 16th World Congress of the ISDE (ISDE 2018) is now open. Click here for deadline date, to review submission guidelines and more. 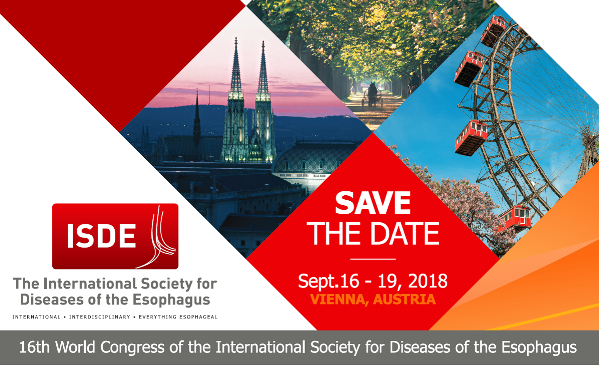 Don't miss the latest newsletter - ESOPHAGRAM - from ISDE. What's going on in the ISDE Database and Research Committee? Watch the video interview with Dr. Donald Low here. DOTE proudly annouces the top 3 reviewers! The Peer Review Week starts on Monday, September 11 – DOTE proudly announces the top 3 reviewers! Find out more about the reviewers visiting the DOTE website or follow us on Twitter and Facebook to stay up to date with Diseases of the Esophagus. Nosy what the Peer Review Week 2017 is? Find out more here. I regret to inform you of the very sad news that our dear colleague Prof. Christophe Mariette, an ISDE 2018 program committee member passed away on July 19. He was Head of Surgery at Lille CHRU, Professor of surgery and internationally recognized researcher in the field of cancer. Prof. Mariette was a great Upper GI surgeon and had been dedicated to his patients. He had been leading an international multi-institutional study for multimodal treatment for esophageal diseases for many years. For ISDE2018, I had been closely working with him on its program until quite recently and he was expected to give several plenary lectures at ISDE2018. This is a sad and great loss indeed to all of us. May his heart and soul find peace and comfort. The ISDE is sad to report the recent death of Dr. Christophe Mariette at age 47. Dr. Mariette began his training at Lille University Hospital in 1994 and spent his career in Lille, rising to become Head of the Department of General and Digestive Surgery of CHRU of Lille. He specialized in treatment of esophageal cancer and was internationally recognized for his research in digestive oncology. He was a vital member of the ISDE Database and Research Committee, and played an active role in ECCG. He was known for his excellent clinical abilities, devotion to teaching, scientific reasoning, self-deprecating humor, and kind demeanor. We extend our condolences to his family, friends, and colleagues. The ESDE 2017 meeting is now live. Click here for more information. Our ISDE Executive Director and ISDE Historian at the CSDE 2017 meeting in Beijing, China. DOTE Journal - impact factor further increased! ISDE is happy to annouce that the impact factor of the society journal DOTE increase to 2.571. The journal is now ranked on place 48 among the gastroenterological journals. Don't miss the chance and sign up to ISDE to get access to the journal!